Florence Nightingale is given credit for the first organized effort of caring for wounded and injured during the Crimean War 1854-1856. The Army Medical Services Museum, in Mytchett, Surrey is now belived to keep " a carriage used by Florence Nightingale during the Crimean War"
When she first arrived in the Crimea, she travelled on horseback making the inspections, she then transferred to a mule cart, and was reported to have escaped serious injury when it was toppled in an accident. Following this episode she used a solid Russian-built carriage, with waterproof hood and curtains. 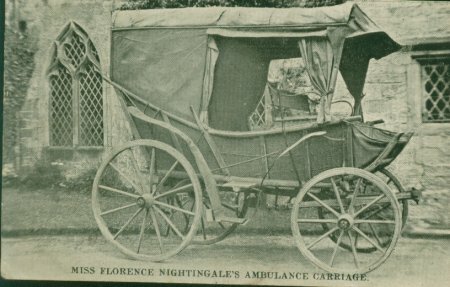 The carriage was returned to England after the war and subsequently given to the Nightingale training school for nurses, which she founded at St Thomas's hospital. The carriage was damaged when the hospital was bombed in the Blitz. It was restored and transferred to the Army Museum in Aldershot.